The UNESCO International Institute for Educational Planning (IIEP-UNESCO), with support from the Global Partnership for Education, has just published a new comparative synthesis on how school grant policies are unfolding in four francophone countries. 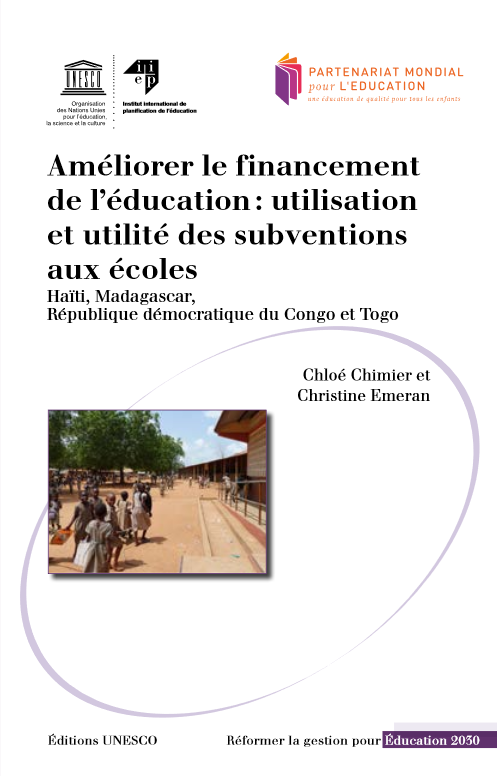 The publication (in French), by Chloé Chimier and Christine Emeran, draws from interviews with over 1,000 stakeholders and 60 school visits across Haiti, Madagascar, Democratic Republic of Congo, and Togo. Does school autonomy result in better quality? Over the past two decades, school grant policies have become a very popular education policy choice. This has coincided with the global trend of decentralizing education systems and a widespread commitment to free education. School grant policies are designed to give schools more autonomy in financial management with the intention of finding more local solutions to improving access, equity, and the quality of education. But do these policies really achieve their goals? To help answer this question, IIEP-UNESCO launched in 2010 a major study on the use and usefulness of school grant policies. The research in the four francophone countries represents the final chapter of the project, following similar research in other parts of Africa, Latin America, and the Caribbean, and East Asia and the Pacific. The new comparative synthesis examines why and how school grant policies were designed and implemented in the four francophone countries. It reviews the actual use of school-level grants and analyzes policy formulation and allocation and distribution mechanisms to better assess their utility and potential. Aina is a young school girl in Madagascar whose mother struggles to send her consistently to school. She’s featured in a documentary film, produced by IIEP, on the implementation and perceptions of school grant policies. Delve into Aina’s world and learn how these policies work and how they are perceived by a range of actors, from teachers, principals to parents. As part of this research project, technical guidelines will be available in early 2018 to help countries design and implement school grant policies. Intended for political decision-makers and educational planners, the guidelines present a variety of challenges and the different strategic solutions to consider from policy conception at the central level to implementation at the school level. A series of eight short videos were also produced to accompany the guidelines. The series addresses practical issues related to the design and implementation of school grant policies. Through the experiences of politicians, teachers, and IIEP’s researchers and experts, these videos present concrete options for the successful implementation of these policies. Watch videos related to the technical guidelines on school grant policies.